Brody came to me at eight weeks old from a breeder in Florida, whom I have become friends with. Brody is a male blue merle with the most unbelievably blue eyes and is, actually, a Mini Aussie. He is both gorgeous AND smart! At twelve weeks he sits consistently, including when I call him and he comes to me. (I don't like dogs jumping up on me!) He knows the commands sit, lie down, and roll over already!!! And he's only 14 weeks old. I had a red merle Aussie (Jennie Sue ~ named after my first best friend!) who passed away last Sept. due to cancer. She was my heart. I became very depressed as Spring was coming and I had no "buddy" to hang out with during the day. Then my husband suggested my depression was about Jennie. 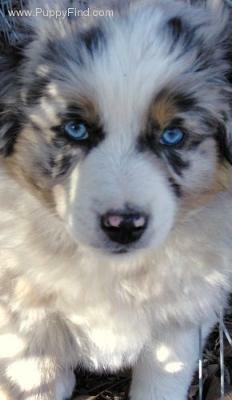 He told me to find another Aussie and get him/her. I decided I would try a male this time. I am looking forward to a long life with Brody. He gives me strength when I have none. He makes me laugh when my body hurts so bad I want to cry. He makes me move when my muscles are screaming to STOP! He encourages me to get out of bed and play, when all I want to do is sleep my life away. He has given me back joy in life. You see, I am handicapped with Systemic Lupus, Rheumatoid Arthritis, Sjogren's Disease and others. Brody has saved my life, just like Jennie before him. When I need a reason to live, Brody gives that to me. He is my friend, my savior, and my co-pilot in my mini van. Thank you Brody!!!! And GOD!!!!!!!! Comments for Brody the Best Dog in the World! Brodie - the best dog in the world! We live in the UK and also have an Australian Shepherd named Brodie. He's a cheeky boy and a red tri-colour. We love him dearly, he never stops making us smile. We also think Brodie is the best dog in the world! I too suffer from chronic health problems and my Aussi mix does the same for me. She is my lifesaver - Sadie. She was there for me when my husband passed away and I knew I had to get up and take care of her. If it wasn't for that I too would have stayed in bed and slept my life away, or worse. Your Aussie is just beautiful and does have the most gorgeous eyes. I hope you enjoy him. They are our best friends.